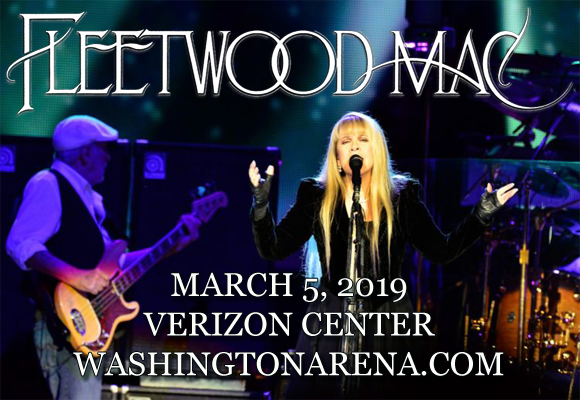 Widely regarded as one of the greatest pop-rock bands of all time, Fleetwood Mac comes to Verizon Center on Tuesday 5th March 2019! Performing an assortment of hits from their five-decade career, Stevie Nicks, Christine McVie, John McVie and Mick Fleetwood will be joined by Mike Campbell (Tom Petty and the Heartbreakers) and Neil Flynn (Crowded House) for an unforgettable show! Don't miss your chance to see these legends, live! From the early days of Peter Green, Mick Fleetwood and Jeremy Spencer to their current iteration, featuring Tom Petty and the Heartbreakers' Mike Campbell and Crowded House's Neil Flynn, Fleetwood Mac are one of the world's biggest bands. A blues band originally, Fleetwood Mac burst onto the music scene with their 1968 UK number one hit “Albatross”. The band experienced a drastic change in personnel throughout the early 1970s, and by 1975 they landed on the best-selling line-up of Lindsey Buckingham (guitar, vocals), Stevie Nicks (vocals), Christine McVie (keyboards, vocals), John McVie (bass guitar) and Mick Fleetwood (drums). Their 1977 album Rumours was a huge hit and now stands as one of the best-selling records of all time, having sold over 40 million copies worldwide. The band saw continued success throughout the 1980s, continuing to record and tour over the years, and in 2018 the band was declared MusiCares Person of the Year, becoming the first group to win the award.